Does NOT include shock absorbers. We recommend Falcon Performance Shocks. 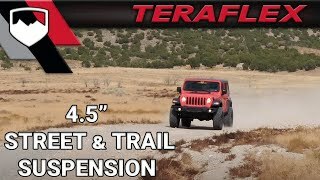 Falcon shock absorbers and TeraFlex lift coil springs have been engineered together to improve both compression and rebound for optimal vehicle stability. The Sport ST4 Suspension Systems is offered with a choice of Falcon Series 3.3 Fast Adjust Piggyback Shocks or Series 3.1 Piggyback Shocks or without shock absorbers.